“We’re going to stay in the customs union on this deal, we’re going to stay in large parts of the single market, and that means it’s vassal state stuff,” raged former foreign secretary Boris Johnson on Tuesday, over Theresa May’s planned Brexit agreement. May’s deal is likely to ensure there is a UK-wide ‘customs backstop’ – a mechanism to ensure there is no hard border in Ireland after Brexit, by ensuring there are few checks of goods going between the EU and the UK. The Tory right have been in outright mutiny over the prospect of, umm, frictionless trade between Britain and the EU. But what did Boris Johnson have to say about the customs union and single market before the UK voted to leave? “I think we could do that [leave] in a friendly way; there is no reason for hostility or rancour on either side. If we got it right, we could negotiate a generous exit, securing EFTA style access to the Common Market – and they would have every motive to do such a deal, given that the balance of trade is very much in their favour. EFTA membership ‘typically foresee the elimination of import duties on industrial goods and fish’, according to the organisation – key planks of the customs union. That of course involves abiding by EU standards on these products: “To circulate freely within the European Economic Area [as part of an EFTA-style deal], products must conform to certain requirements laid down by the EEA Agreement aimed at protecting legitimate interests, such as health, safety and the environment,” the organisation point out. We shouldn’t necessarily take Johnson’s views at face value given he is a serial u-turner (only a cynic would call him a liar, surely). “There’s a perfectly viable relationship to be had which is happy, contented with the single market, trading freely but not with the whole shebang,” Johnson said during a speech at the Thomson Reuters headquarters in Canary Wharf. While May’s deal gives the UK control of Britain’s border, Johnson’s 2013 proposal of staying in the Single Market would mean the continued free movement of workers, goods and services within the EU. Who’s this softy? There’s plenty more examples to draw from, but you get the picture. Boris Johnson played up staying in a customs union and the single market when he knew leaving would be a vote-loser: voters knew a harsh Brexit would be an economic disaster, so it wasn’t on the cards. Now the wannabe PM – and former softy – is playing up his right-wing credentials to cosy up to Tory Brextremists. 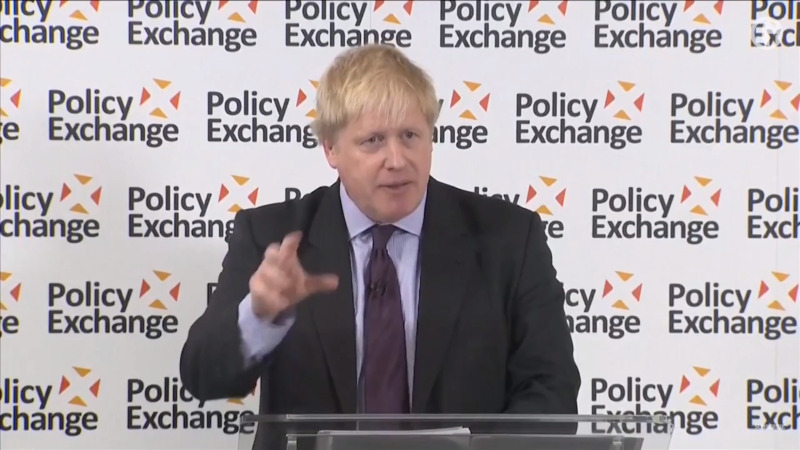 “For the first time in 1,000 years this country, this Parliament will not have a say in the laws of this country…it is utterly unacceptable to anybody who believes in democracy,” Johnson said on Tuesday. But Johnson doesn’t really believe in democracy, by his own reckoning. Instead, he’s prepared to say just about anything to stay atop the news agenda.